The bottom half of an old barn Dutch type door became the perfect backdrop for a Potting Shed sign stenciled with a new garden stencil from Funky Junk Interiors' Old Sign Stencils. My 24" sign was stenciled on a great piece of barn wood with Fusion Mineral Paint in Champlain. I sprayed the sign with a Krylon Matte sealer to protect it from the elements. * All stencils are made out of a heavy weight 10mil, making them super durable long term. * Each has center point registration cuts, making positioning a breeze! * A super dry brush is key to sharp lines! Load your brush, then tap most of the paint off again onto a rag. Apply paint by tapping up and down for best results. * Fusion is self levelling, which greatly minimizes brush strokes. Use a quality brush or sprayer for best results. * Great for indoors or out. I also added a re-purposed wooden gun rack from the thrift shop to my barn door backdrop, also painted with Fusion Mineral Paint in Champlain (a great white). I love displaying vintage garden tools, and the gun rack works well for my shorter handled tools. I centered a galvanized farm watering trough in front of barn door, freshly planted with dark red geraniums, White Knight alyssum and Laguna Beach lobelia. Since there were just so many stenciling possibilities and designs with the new garden stencils from *Old Sign Stencils, I used the design on the lower right of the graphic above on an old wooden crate. The lettering is stenciled with Fusion Mineral Paint in Coal Black, the flower petals are in Champlain and the leaves are in Upper Canada. To protect my design and deepen the wood tone and wood grain, I brushed on Fusion Mineral Paint water based Tough Coat Sealer. 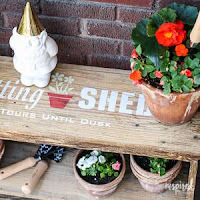 The old crate makes a great display piece attached to a garage sale wood pedestal base with screws. Just in case of strong wind I have it close to the house, even though it's quite stable. The galvanized bucket inside the crate is planted with calibrachoa, verbena and bidens. This giveaway is open to residents of Canada and the United States, 18 years or older. Void where prohibited. Each blog will draw one name from their comments, which will be pooled together to pick one ultimate winner. This giveaway ends Sunday, June 5th, midnight Pacific, and winner will be emailed and announced on this post Tuesday, June 7th. Good luck and happy stenciling! 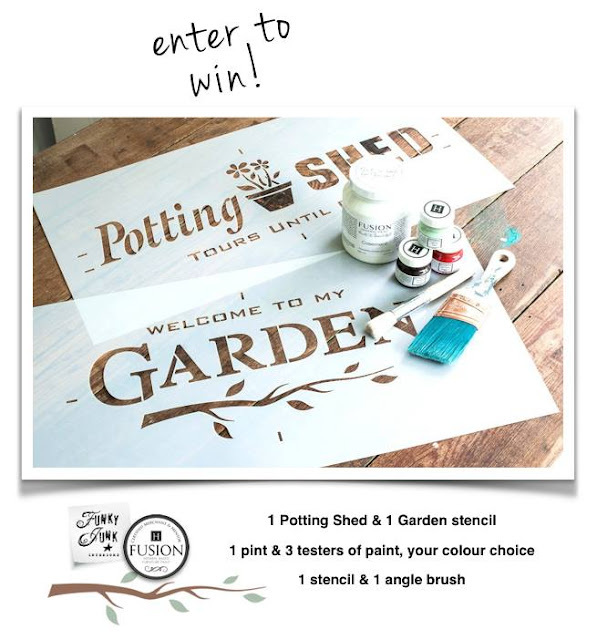 Please be sure to visit all of the bloggers joining the garden launch stencil blog hop today for even more ideas! Thanks for visiting and happy stenciling! 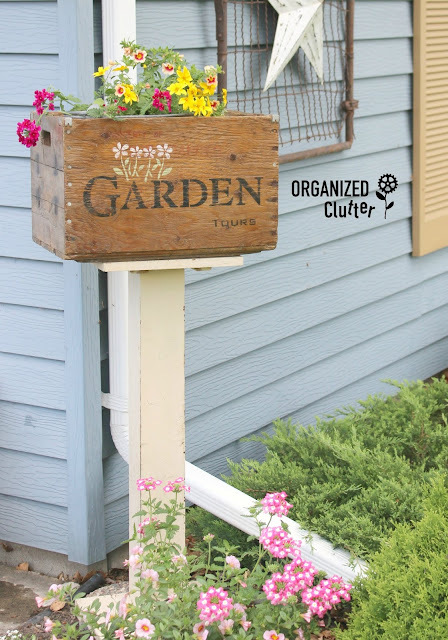 I love it Carlene and the stenciled crate is gorgeous! Oh Carlene... you had me at barn wood and crate. I honestly don't know what to drool over first! 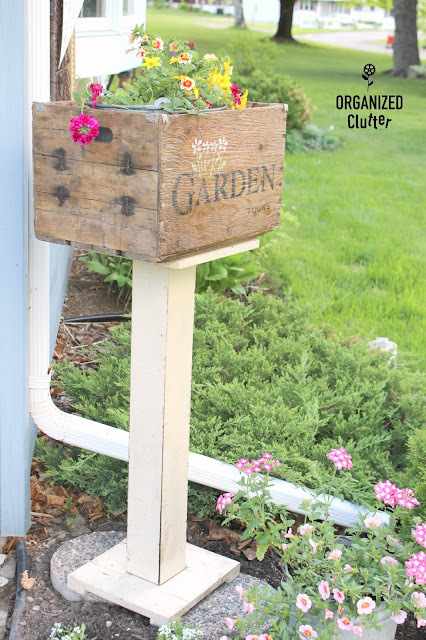 The crate sign has given me so many cool ideas... what a neat, unexpected feature in a garden! You do these garden themed stencils justice, my friend. I'm so glad one of my fav garden junk queens was a part of this one. Thank you for your beautiful projects being a part of this launch! Your projects are wonderful, Carlene! I love making signs and decorating crates! I would love to stencil some old crates I have!! These turned out so great, I especially love how you took a gun rack and turned it into a shovel holder. I'm thinking I need to track one of those down. This is so inviting. 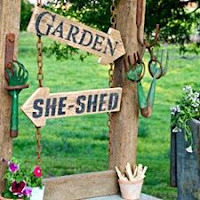 Love, love, love the signs + everything else in your gardens. They are such an inspiration to me. Thank you so very much for sharing. I have two vintage ammo boxes I'm using for flower boxes. Stencils would be a perfect addition. my stencil projects would start with a great metal flower holder, then signs for my garden then birdhouse posts then.....no end to ideas to use these. Love your signs!! Please add an email address if you enter as unknown. Oh, that crate of bright flowers...I absolutely love! The stencil was the perfect touch to make it spectacular. Makes me want to drop everything and just stroll through the garden. Awesome project! So fun to visit you today. 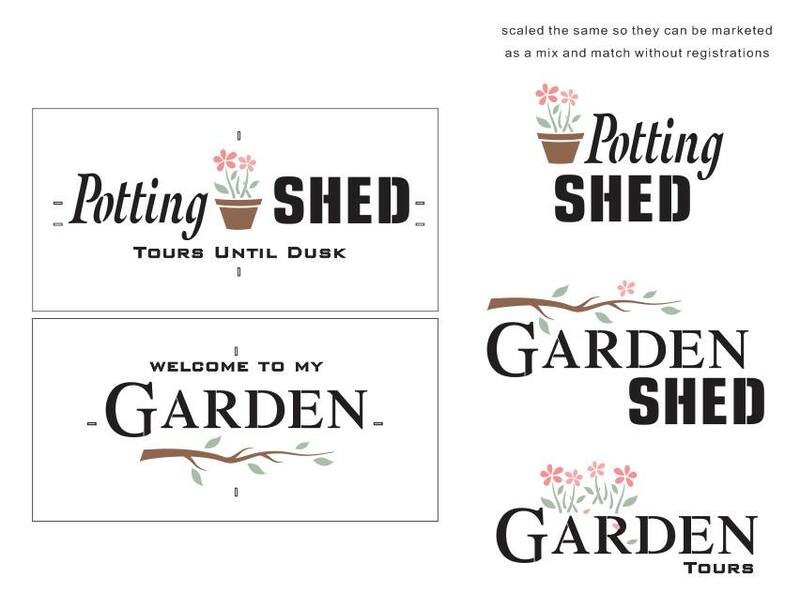 Love these stencils and your great ideas...I would use them for a wooden sign for my flower garden and stenciled onto my shed. 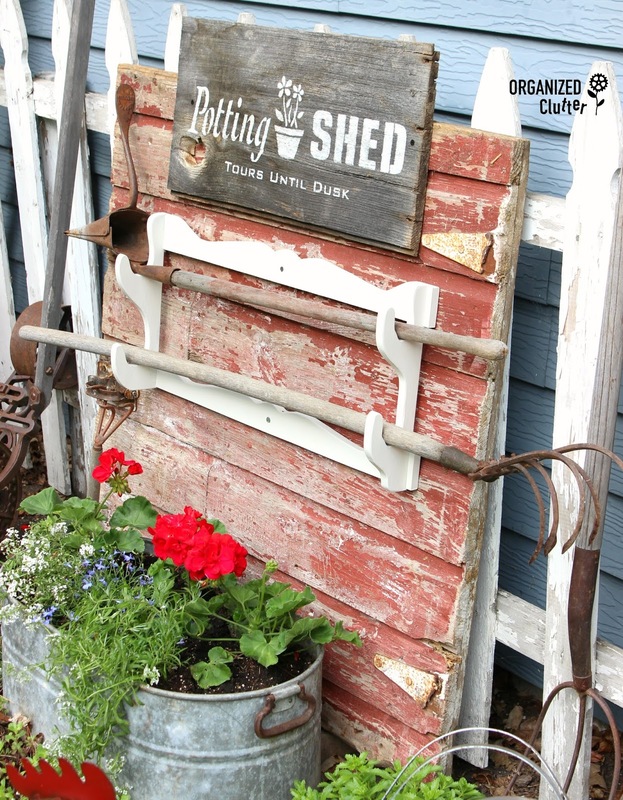 I love your vintage garden tools display! I would stencil some old weathered boards to go with my old ladders on my front porch! I use them for flower pot displays and they need a good old sign. Beautiful inspiration. 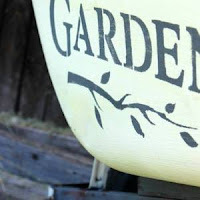 My garden is next on my list to add some funky signs on planter boxes. Thanks! 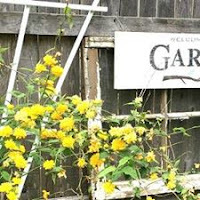 Life is better in the garden...I really enjoy your blog!! Signs are wonderful! I would stencil everything I could. I think I would stencil an old rusty shovel I have stashed away. 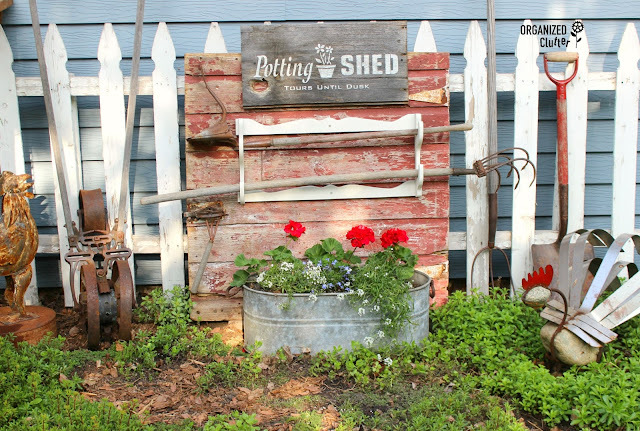 I would also love to do some planter boxes like yours - very pretty! PLEASE LEAVE AN EMAIL ADDRESS IF YOU ARE COMMENTING ANONYMOUSLY. I won't be able to get a hold of you if you win the contest. Love everything you stencil. My husband and I have just repainted our house and front porch. Plus we had all of the shrubs pulled out in front of it. I think a sign on my freshly painted porch would be awesome. I am making a potting bench out of reclaimed pallets and other wood. I would love to be abdle to decorate it with the stencils and paints. How fun, would love to give these a try on a couple of plain wood boxes. And I'm thinking on the shed door. You and Donna have awesome style and talent! 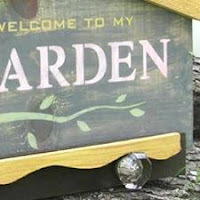 I have a stash of old barn board and would love to make a "Welcome to my Garden" sign. I have the perfect spot for it; I have hopps climbing up a trellis and would love to put the sign in front and train a few vines around it! PS - this idea is from your biggest fan in Baudette... ME! 2nd attempt to comment.... sorry if I doubled up. You are my go to page for garden inspiration! I have finally collected a few old wood pieces that I'd love to stencil for my garden. 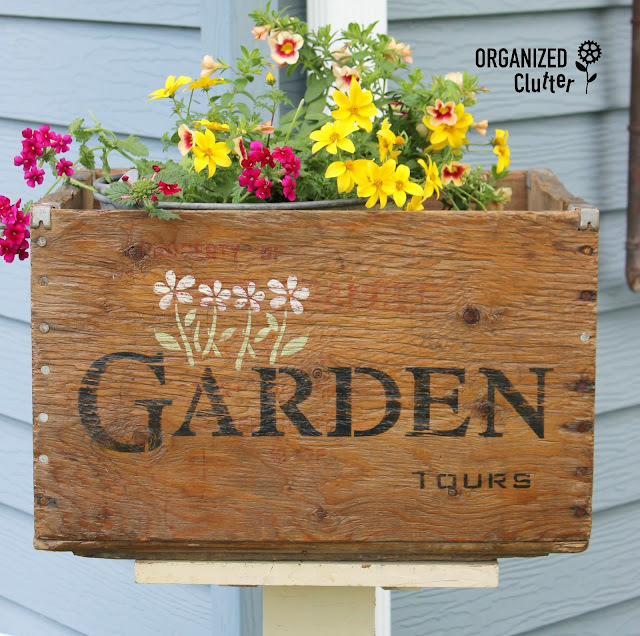 Love the garden tours one! I love your junky garden ideas! 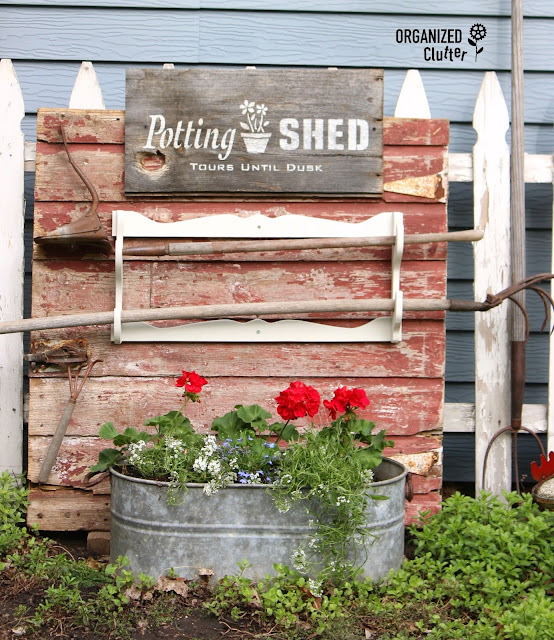 I have a couple of galvanized buckets I would use the stencils on. Thanks for being such an inspiration! We have a garden shed, but hardly any garden to speak of. I would start by stenciling that shed and work out from there! Thank you for the opportunity to win! Beautiful gardens and very creative. Would like to make signs and stencil wash tub. Thank you for your inspiration. Your use of the signs and barn wood are beautiful. I have an unused gun rack that may now have a new purpose...now to find an old galvanized tub and get to work with stencils! I have some barn wood I would love to stencil as well as some crates. Love your ideas! 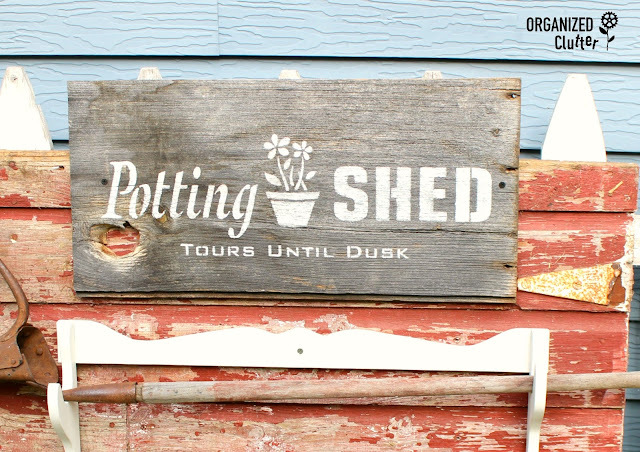 Barn wood with Potting Shed Tours Until Dusk! 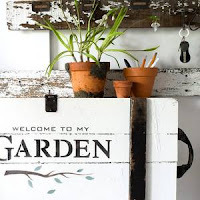 Love your garden signs and display"
I would stencil some signs on old bar wood, also some galvanized pails.